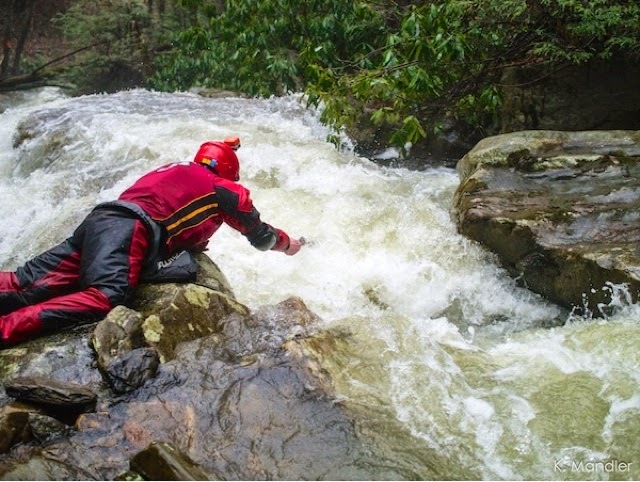 THE NEXT LEVEL: West Virginia’s Savage Indian Creek. 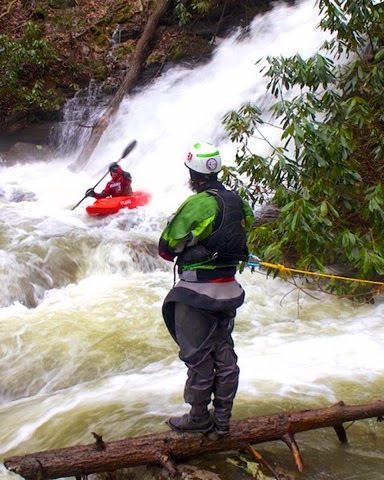 by Bobby Miller | DBP MAGAZINE ONLINE The World's Best Free Whitewater Publication. Nestled in a steep ravine deep in the Cheat River Canyon, lies a tiny creek that cascades down from the canyon rim to river level in the most intense fashion imaginable. With its 600 feet of drop in the final half mile and steep canyon filled with rhododendron thickets, it is a long day that taxes every fiber of the human spirit. 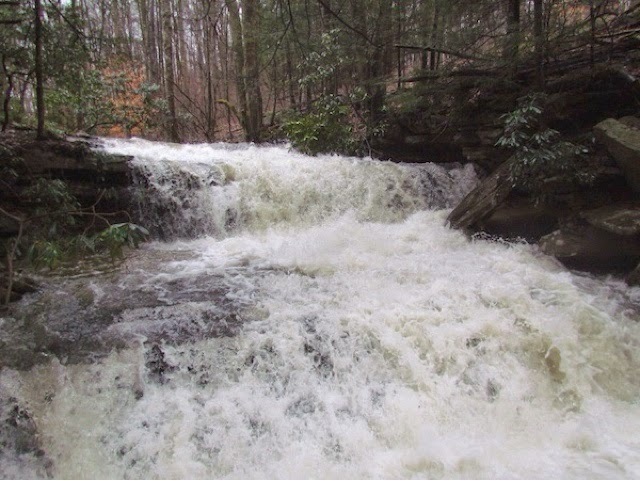 Almost all of the drops are “runnable” but this term must be used loosely when describing this creek. 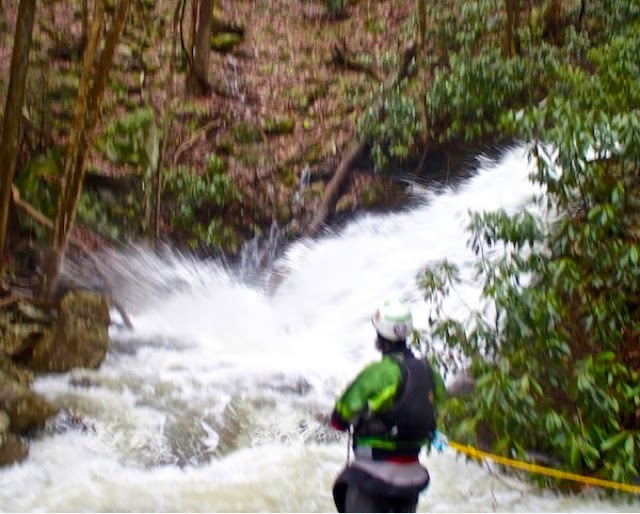 It is no place for the casual thrill seeker and only the most driven and cavalier of creek boaters would even consider many of the drops. The tall drops, shallow landings, and sharp rocks create a venue where you could have the best day of your life, or the worst. A small miscalculation or error on your line will give the opportunity to see first-hand what happens when an unstoppable force meets an immoveable object. 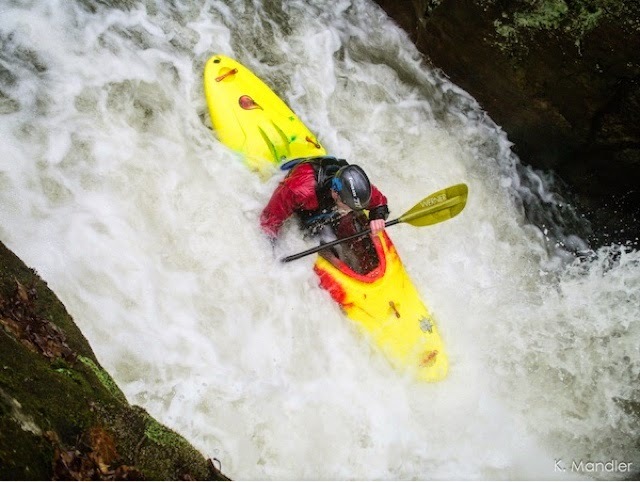 Pursuing the next level of what is possible to run in a kayak is much like a dog chasing a car. What are you going to do if you catch one? 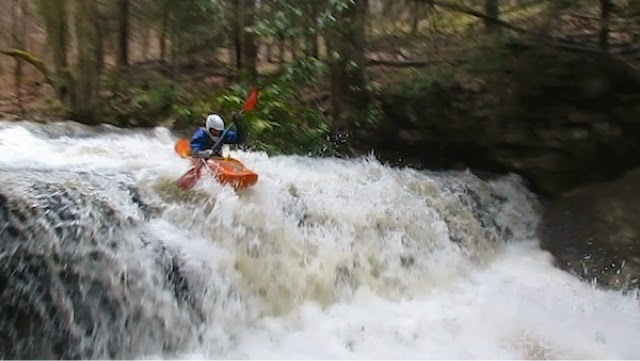 If you find yourself on a creek such as this one, you truly are in a situation where you have to face your fears and decide just how much you are willing to risk your health and well-being for the thrill of the extreme. Do you retreat to the relative safety of your usual runs or do you snap your sprayskirt into place and slide off the bank to be part of the insanity? After all, madness is like gravity, all it takes is a little push. Laurel Creek was “discovered“ in the early 2000’s by Ben Dunham. He called me up one day and told me that he found a new creek that had a lot of waterfalls and wanted me to go hike it with him. Once I laid eyes on this wonderland of gradient, I knew that I was looking at a creek that I was destined to return to with a boat. We decided to give the run a nickname to ward off any would-be first D thieves and thus, the Savage Indian was born. The idea for the name stems from the fact that the creek flows out of a lake with a Native American name (Chippewa) and the Savage part was a ploy to get people to think the creek was in the Savage River drainage, nearby in Maryland. It ended up that a year and a half would pass until any of us were able to make this impossible dream a reality and catch it at a runnable flow. 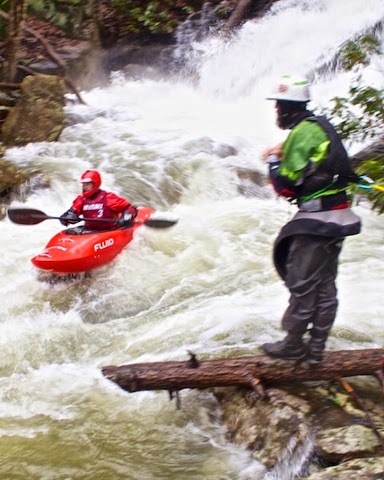 Ben, along with JB Seay, got the first crack at it but the water level ended up being too high so they hiked out at the first rapid. The next day, following an afternoon thunderstorm, Todd Baker and I went in at a low flow and made a descent down to Split Rock Falls before running out of light. Don and Doug Smith made a run of their own a few months after. About a year later, a huge group converged on the creek at a nice water level with visions of grandeur in their minds. Unfortunately, several new trees had fallen, which limited the amount of runnable drops and gave this creek a bad reputation as a massive waste of time. So, the creek sat for over a decade, forgotten and untouched, waiting for a new generation of adventure seekers to come and try to prove their mettle against one of the craziest series of drops in the state. A little over a year ago, I decided that I needed to return to the Savage Indian. I was not satisfied with my previous runs and I wanted another chance to run this creek. My desire to run this creek and take on all of the elements that go with it has always been strong. What some people call hell, I call home. 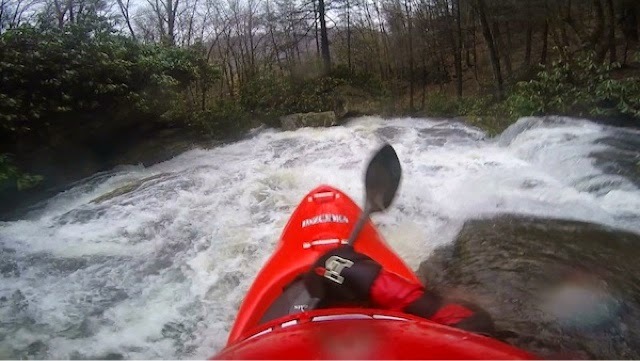 I gathered a group to go in to clear wood during the low water of winter and the creek was finally ready for a descent. 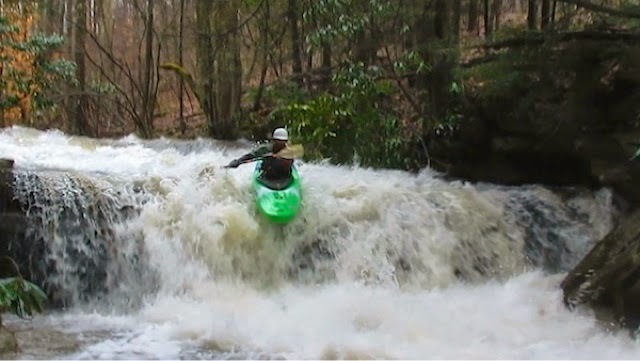 With the recent spring rains combining with the snow melt, I knew that the best chance to find a runnable flow would need to come in early March while the ground was still saturated. I got my chance on Saturday, March 14, and I was able to convince a few guys out of the local crowd to come join me on this escapade. I met Abed Borsa, Kyle Mandler, Brad Ramano, and Chris Kyle at Teeters Campground because we had received some inaccurate beta saying we could drive an old logging road along the Cheat to the confluence. The logging road ended up being gated so we left vehicles there, creating a 2-3 mile hike out at the end of the run. We figured that would put us closer to Daugherty Run, which we hoped to paddle afterward. When taking on a serious run such as this one, it is important to have a strong group of boaters with you. I felt very good about the idea of heading into this dangerous canyon with this crew. We picked up Brenton Petirillo, another accomplished creeker, on the way to the put-in, which made the group even stronger. I was finally going back to run this creek and I could hardly sit still on the drive to the put-in. The headwaters of Greens Run were cranking and fusillades of brown water were gushing from every orifice in the ground. I started wondering if the Savage Indian could actually be too high. The suspense was terrible and I hoped it would last. Finally, we were driving along the lake and turned down the lane that goes to the put-in. I was horrified to see the creek creeping along with a clear complexion and not much flow. I had heard rumors of flow being held back by the dam in the past during high water but I never thought that would happen this time. The group was unhappy with this hard cheese that had befallen us and was ready to give up for other, more reliable options. However, I implored them to reconsider on the premise that the tributaries that come in later would create a runnable flow. We decided to go for a hike and form our assessment at the first rapid. Several of us hoofed it through the woods for a half mile to the first cascade. By this point, one major trib had come in along with some smaller ones and created a “floatable” level. I hoped that the sight of this slide would sway the group toward giving it a go. I knew that it would take every single cubic foot per second that mother nature could muster to seal the deal. With a little bit of positive reinforcement on my part, the group decided that they would indeed run the creek. The run started with a little bit of scraping and some tree portages as the creek meanders along the plateau. Soon, we were at the first drop, Siren Song, a fun slide into a 6 foot clapper ledge. Everyone had nice runs down this rapid and this was probably the point where the level of stoke in the group was at its peak. We portaged the next drop, Sneaking Out the Hospital, since it is a 20+ foot drop into a rock pile. 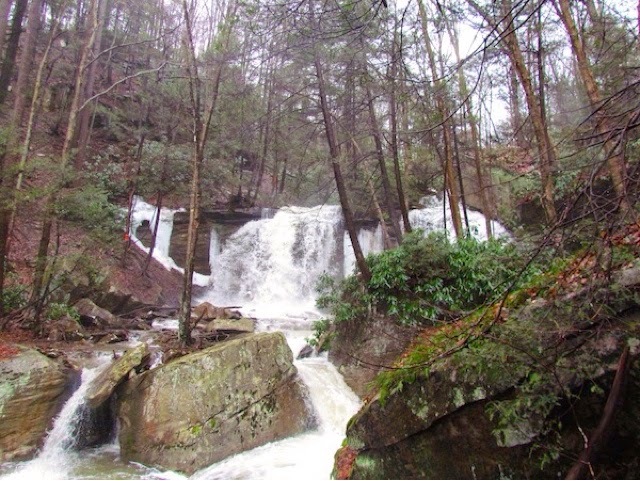 The creek flows swiftly through a couple strainers before going off another falls. I have thought long and hard about this falls on my past runs but the fact that it is a 30 + foot drop into a knee deep pool has always turned me away. The lip is set up beautifully, sloping down to a nice boof ramp. However, even a perfect run could result in tapping bottom with some part of your boat and the low flow didn’t help at all with cleaning up the landing. For all intents and purposes, the runnable section begins below this. 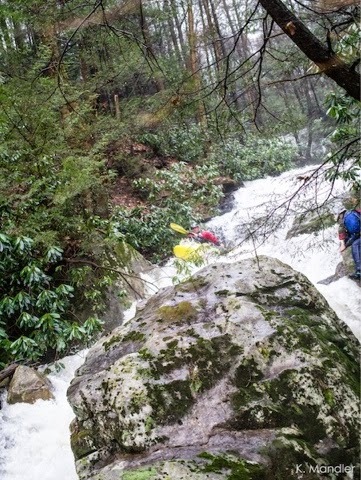 After some small boulder drops, the creek goes over Crash Landing, an 8 foot clapper that has dealt out its share of crushed bows in the past. This feeds right into Slim Shady, a scary double drop with a horrific sieve on the left that steals half the flow and an 8 foot slot boof on the right that always seems to need more water, even when the creek is high. I looked it over and didn’t like any part of the way the rapid looked at this level. I have never run this drop in the past, mainly because of the scary sieve with its junky approach drop. If I thought I could guarantee good calculated strokes off the approach drop, I would be more confident about running it. However, at this low level, I just wasn’t feeling it. That’s not what I call rock and roll! However, Brenton saw a line and decided he was going to fire it up. He got a nice boof to clapper off of Crash Landing and headed quickly into Slim Shady. He came into the rapid too far right and subbed out on the approach drop. He got pushed into a small slot on the right, which did not line him up well at all for the boof. He slid toward the boof rock and gave the best stroke possible for the thin flow that he had. He had to stick his hand out to brace himself on the midstream boulder. This killed his momentum and caused him to fall 8 feet into a stiff piton. He was ok aside from a bent bow but that line didn’t do turkey for my desire to run the rapid, so I walked. The next drop is called Sabotage and is named this because a couple of junk rocks are hidden right below the surface to prevent you from getting to the correct line. 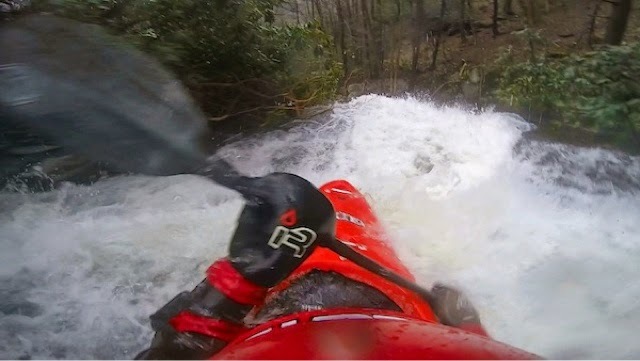 The rapid looks good with the flow going over a boulder in the middle with a 6 foot boof. However, the boof rock was shallow at this level and there is a tight pocket with branches on the right and a piton rock on the left. I spent some time probing the approach with a stick to see where the guard rocks were. Most assuredly, the guard rocks would mess with your run at this flow, so we all walked. The next section of boulder drops was runnable, but fed right into a tree portage, so we kept the boats on our shoulders and stopped below. A major trib came in and the creek was now at a good level. With a long series of high quality boulder drops extending for the next 200 yards, things were looking up. I assured the group that this section was clear of trees and it would run right into one of the best rapids in the state, Rally Round The Family/Pocket Full of Shells. Encouraged by this, we walked down to scout. Rally starts with a long slide that gets gradually steeper before cascading off a 30 foot drop that slams into the bank. The key to running this cleanly is to turn your boat sideways as you launch off the last kicker. A miscalculation of your line would cause a high speed collision with the rocks at the bottom, and would be an experience comparable to kissing an express train. As soon as you land, the water feeds right into Pocket, which is a 4 foot drop onto the lip of a 12-14 foot clapper waterfall. 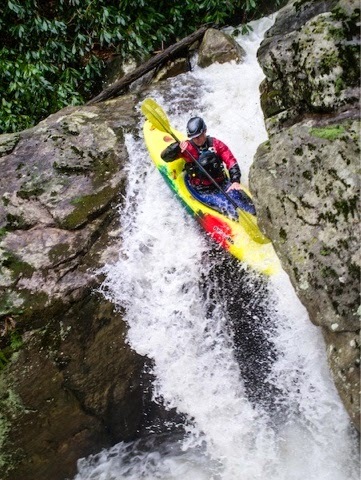 As stoked as I was about this rapid, I could see on the faces of my comrades that they weren’t wild about the high impact potential. Brenton liked what he saw so we both decided to run it. The rest of the group agreed to set extensive safety with Chris Kyle on a tether to jump in between Rally and Pocket if something went wrong. I put in at the top of the boulder section and had to negotiate several excellent Class 5 drops just to get to Rally. These drops are steep and were padded with the extra flow. 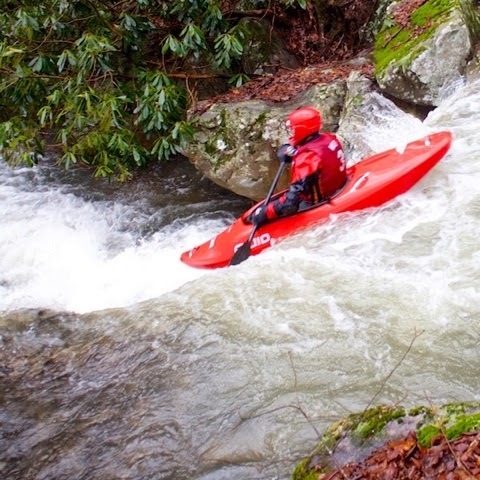 They would right at home on some of the classic West Virginia creek runs, such as Manns Creek. The first boulder drop had a troublesome tree at the bottom to get around, so I asked Brad to sit there for safety. I caught the eddy above it and ferried out to nail a series of tight boofs. Soon, I hopped out to scout the approach to Rally. Since the creek splits on an island and the left side falls onto rocks, I wanted to make sure I was on the right. Plus, the main cascade steps down off of a few shelves before freefalling into the tight landing so I wanted to know which shelf to turn sideways off of. I got in my boat and started down the slide. I lined up with the flow and hit the part where it got steep. A cross-current pushed me a little further right than I wanted, so I turned sideways to get back left. I skipped off the last shelf and caught a major bounce that threw me airborn! My bow lifted, causing a wheelie boof, as I soared through the air. I stomped it down as I landed in the perfect position in the LZ. Shooting out from Rally, I was heading for Pocket and could hear the group yelling at me. I was unsure what they were saying but I was already committed to the drop. 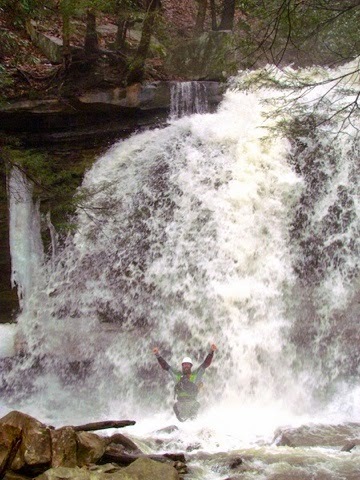 I kept my momentum through the approach drop and launched a big boof off the main falls, landing flat on the padded slide below! As I celebrated in the eddy, I could still see looks of concern on the faces of the group. They were tapping their heads, and I went to tap mine in return. 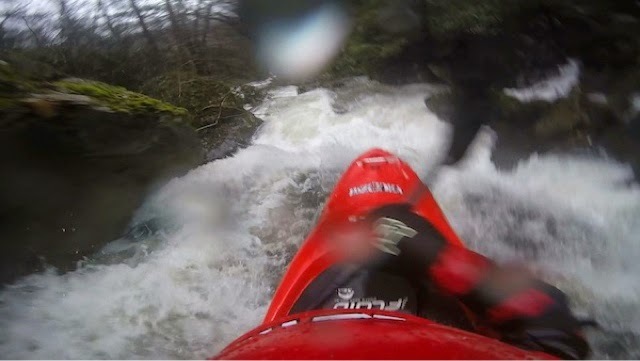 That was when I noticed that my GoPro had come unattached from the mount on my helmet, and was floating in the creek. It floated by before I realized where it was and continued onto the next slide and off the next falls. I walked down the creek after it, knowing that I may never see my new camera again. The next falls (Split Rock Falls) drops 25 feet into a boulder, but has a narrow pocket on the right that a boater could land in. Had my camera hit the line and plunged into this area? I got to the lip of falls and was elated to see the camera floating in the eddy on the right. I climbed down and picked it up out of the creek. I walked back up to my boat and saw the group packing up to walk out. At this point, the group told me they were going to retrieve their boats and hike the fire road down to the Cheat River. They had seen enough and had no interest in trying to finish the creek. I can understand their disappointment, they had not seen much that they wanted to run and they had missed a day on the classic Albright creeks to come along on this mission. This was not their cup of tea, and I can respect that. However, we were so close to the goal of paddling the creek all the way to the Cheat, and a part of me will always feel empty until I accomplish this goal. I wish I had at least asked them for one more favor. Split Rock Falls was just downstream of where they walked up to the fire road. The runnable line is the same line that my camera took: down the slide, heading right and off the boof kicker, only to land in a narrow spot between a house sized boulder and the bank. It was there for the taking and would have been so awesome to pull off. However, without proper safety, this drop would be foolish to attempt. I went back down to my boat and stayed on the right bank for the hike out. It was another 150 yards of bushwhacking to reach the Cheat. 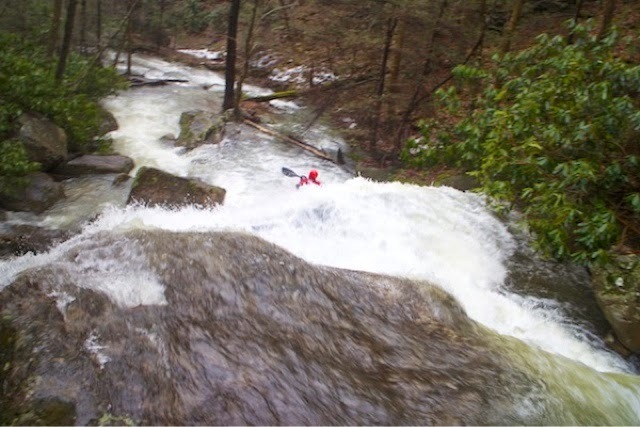 There is still another clean 10 footer and some steep boulder drops before the creek finally ends its descent. Along the way, I noticed that my Go Pro had fallen off of my helmet mount again, but after an extensive search in the woods, I could not find it. * I was so disappointed to have lost my camera, but I didn’t want to lose contact with the group, so I pushed on and met them at the Cheat River. We climbed a steep rhododendron thicket to get to the logging road that leads back. After a long hike out, we finally arrived at the cars, exhausted after such a challenging day. * The story of my lost GoPro does have a happy ending. GoPro showed excellent customer service and sent me a warranty replacement for my lost camera since the clip had failed to stay in the mount twice. However, I felt an overwhelming desire to recover the footage so I organized a group to go back into the canyon and look for the camera. After searching the area for around a half an hour, we found the camera hidden under some brush near the creek. Much to my delight, it powered right up, a testament to the durable product that GoPro makes. It had survived tumbling over two waterfalls and more than two weeks in the woods out in the elements. When I told GoPro that I had found the original camera, they thanked me for my honesty and told me that I could keep the new one they had sent. Thanks GoPro! Due to your incredible customer service, you definitely have a lifelong customer in me! Bobby Miller running one of the high quality boulder drops above Rally Round the Family. Bobby Miller lining up in the approach slide to Rally Round the Family, you don’t want to accidentally go left! Bobby Miller about to go off the big cascade at Rally Round the Family.